Massage therapy has been around longer than you may have thought. It has been traced back to ancient China and Japan, Greece and Rome. With medical advancements in the mid 1900’s, massage therapy saw a decrease, but resurged in the 70’s, mainly as a way to treat sports injuries. As holistic approaches to medicine become more popular, massage therapy has continued to see an increase in popularity. Massage therapy can be an alternative pain reliever to medicinal interventions. Our staff includes five massage therapists who are ready to discuss your pain and concerns to build a treatment plan around. 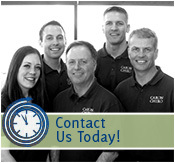 Our practice prides itself on valuing your time, so we work hard to remain on schedule while ensuring we provide quality care to relieve your pain. Your massage therapist can discuss the different types of massages we offer and help decide the best course of action based on your concerns and goals. If you are interested in discussing a holistic approach to pain management, Caron Chiropractic Clinic, P.A. is ready to help. If you are ready to take control of your pain and stop it from interfering with your day to day activities, call us today at (651) 255-9999. This entry was posted	on Tuesday, July 28th, 2015 at 3:54 pm	and is filed under Massage Therapy. You can follow any responses to this entry through the RSS 2.0 feed. You can leave a response, or trackback from your own site.